"White Box" Gillette Platinum DE blades? 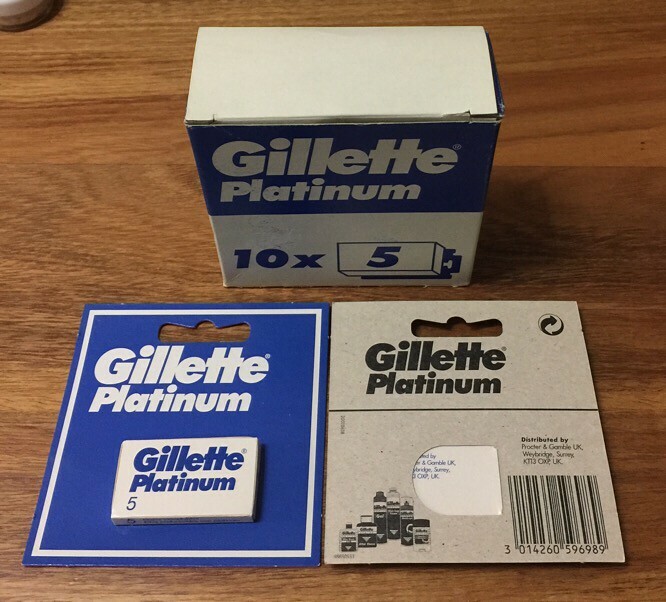 White Box Platinums, often compared to the famed "Gillette Swede"
The accompanying picture appears to confirm that the first statement is correct, at least as to the packaging. But the listing also contains Amazon’s standard . . . There are some threads about white box Gillette platinums in various shaving forums. They are different from blue box. They have gotten favorable reviews but folks haven't liked the price, which has been north of a dollar per blade. I have bought from the seller you cite on Amazon and they are the real deal. Shipping takes weeks and weeks from the Czeck Republic, but they show up. Best blade made in my opinion. Interesting. Will have to follow this and see if someone had tried them. Hear some reviews. (01-16-2016, 07:40 AM)FreddieP318ti Wrote: Interesting. Will have to follow this and see if someone had tried them. Hear some reviews. Same here, I had actually never heard of these. Waiting for 100 to turn up , it was 2 week's since ordering that I got notification of shipping , estimated delivery is early February , very slow indeed and I am in the U.K. Anyone else k own how these compare to the GSB's? if anyone wanted to trade a few for some PolSilvers let me know I wouldnt mind trying some. They were much smoother than GSB, to me. If you want to know how the white ones are, try the dark blue Platinum (not GSB) and it will give you a good idea how the white box performs as well, since they're so similar. (01-17-2016, 01:34 PM)yomuppet Wrote: They were much smoother than GSB, to me. If you want to know how the white ones are, try the dark blue Platinum (not GSB) and it will give you a good idea how the white box performs as well, since they're so similar. Thanks! I'll give them a try! Two and a half weeks later, the listing is gone, as if it never had existed. The listing comes and goes depending on whether they have blades available. It happened to me several times. The sellers have a limited amount of these blades. This thread may itself have contributed to them selling out. So I would be interested to hear from anyone that was waiting to receive these blades and try them out !!! What'd ya think? Are these white packs the same Gillette blades that have been turning up at Walgreens? I've been interested to try them out but haven't found any yet. (02-16-2016, 08:57 PM)vuk Wrote: Are these white packs the same Gillette blades that have been turning up at Walgreens? I've been interested to try them out but haven't found any yet. Seems unlikely. But it's possible. Certainly not the same packaging. They are probably different then. Are the 'white packs' out of St. Petersburg? (02-17-2016, 06:23 AM)vuk Wrote: They are probably different then. Are the 'white packs' out of St. Petersburg? I expect so but don't know for sure. They have the two glue spots to indicate yes. They are not the same. The writing on the packages (Portuguese) and the 3 packs vs. normal 5 point to these being Brazilian Gillettes. Decent but absolutely inferior to the Petersburg products. Just ended up getting a white box and woooow!!! Best blade I have ever tried by far. I agree that the white plats are excellent blades. Similar to a Wilkie Light Brigade. They are very sharp, and my favourite blade match for a Feather AS-D2 razor. (09-18-2018, 01:41 AM)TomG Wrote: I agree that the white plats are excellent blades. Similar to a Wilkie Light Brigade. They are very sharp, and my favourite blade match for a Feather AS-D2 razor. If you're able to find some "Swedes", Gillette Platinum made in Sweden, I think you will like them a bit more.